Patrol Formations are different ways to configure the patrol to meet the desired objective/s with regards to movement. There are a number of “movement” formations – and in this article will discuss the “File” formation. 2. The File formation is typified by all the men being in a ‘line’ – one man behind another – single file fashion. 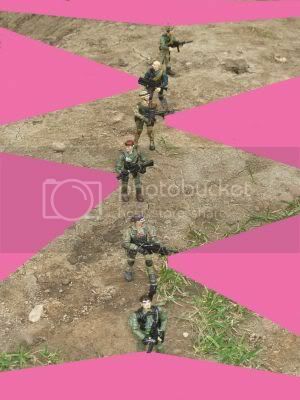 Here is a picture of a six man patrol in file formation (OK – so it is not actually six MEN but rather six ‘action figures’). Note the 1st man – he is called the Point Man (PM). His job is to watch for enemy personnel, booby traps, danger areas (DA) – anything that could compromise the mission. The 2nd man is usually the navigator (NAV). He helps keep the team on the correct compass heading (or azimuth). The 3rd man is usually the Team Leader (TL). He is the “man in charge”. He is responsible for EVERYTHING the team does or doesn’t do. The 4th man is usually the Radio Tele/Operator (RTO). He keeps comms with the base unit/camp. The 5th man is usually the Assistant Team Leader (ATL). He is “2nd in charge” and is the leader in the absence of the TL. The 6th man is called Tail End Charlie (TEC). He is responsible for covering the tracks of the patrol after they cross a DA, took make sure that the patrol is not being followed and to alert the patrol if he sees anything that could compromise the patrol from behind. 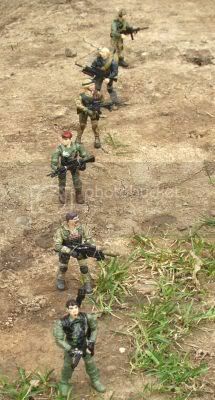 Note which direction each man has his Main Battle Rifle (MBR)/Main Battle Carbine (MBC). The PM can choose whether he is right handed or left handed – it doesn’t matter – as his Area of Responsibility (AoR) is from 10 o’clock to 2 o’clock (the direction the team is headed is ALWAYS 12 o’clock). The 2nd man can also choose which way he points his MBR/MBC – and we are going to say that he choose to be “right handed” so his MBR/MBC is pointing naturally to the left. That means his AoR is from 8 o’clock to 11 o’clock. He NEVER looks to the ‘other side’ – as it is NOT his AoR. Every man in the patrol is trusting everyone else to watch THEIR OWN AoR! The 3rd man has NO choice in the matter – he MUST “play off” the 2nd man. Since the 2nd man chose to point his MBR/MBC to the left – then the 3rd man MUST point his MBR/MBC to the right (making him “left handed”). His (the 3rd man) AoR is from 4 o’clock to 1 o’clock). He NEVER looks to the ‘other side’ – as it is NOT his AoR. Every man in the patrol is trusting everyone else to watch THEIR OWN AoR! The 4th man also has no choice – he must “play off” the man in front of him. Since he can see that the man in front of him has his barrel pointed to the right side – the 4th man must point his barrel to the left side. His AoR is from 8 o’clock to 11 o’clock. He NEVER looks to the ‘other side’ – as it is NOT his AoR. Every man in the patrol is trusting everyone else to watch THEIR OWN AoR! The 5th man doesn’t have a choice either – and he must take the right side (same as the 3rd man) – and his AoR is from 4 o’clock to 1 o’clock. He NEVER looks to the ‘other side’ – as it is NOT his AoR. Every man in the patrol is trusting everyone else to watch THEIR OWN AoR! The TEC can choose which side he chooses – as his AoR is from 3 o’clock to 9 o’clock – he provides for rear security. While each man is scanning his SoF – he also has EYE CONTACT with the man in front – and as he scans back – he has EYE CONTACT with the man in back. That way communication gets passed up and down the patrol QUICKLY. The ‘scans’ that one does, typically takes around 4 seconds from one end of his AoR to the other end of his AoR. For example – the 2nd man – he begins his scan by looking at the man in front of him (PM) – then scans his AoR rearward from 12 o’clock until he looks at the man behind him (3rd man) at 6 o’clock – HOWEVER – his MBR/MBC only moves from 11 o’clock to 8 o’clock. This way he is not ‘sweeping’ his buddy. (Sweeping is the term used when someone’s muzzle points at another person.) It takes about 4 seconds depending upon a lot of factors – but it is a ‘average’ time frame. He then scans forward from 6 o’clock up to 12 o’clock and looks at the man in front. AGAIN – his MBR/MBC only travels from 8 o’clock to 11 o’clock. He (and everyone else in the patrol) repeats this process the whole time that they are moving. The reason each man LOOKS at the person in front and behind is to pass ANY and ALL hand and arm signals up and down the patrol. Hand and arm signals are beyond the scope of this article – but just remember that for future reference. The distance between team members on the patrol is dictated by many factors (METT-TC) – but the “rule of thumb” is that if you can see the man in front of you AND the man behind you – that is about right. Increase the distance in thinner areas of cover/concealment – and close it up when in areas of thicker cover/concealment. This article should also explain ONE of the reasons we do 'right' and 'left' handed shooting in the RQC - as you will be both in a patrol (if you rotate around - as you should) and you need to know how to operate your MBR/MBC just as well left handed as you do right handed - and vice versa!